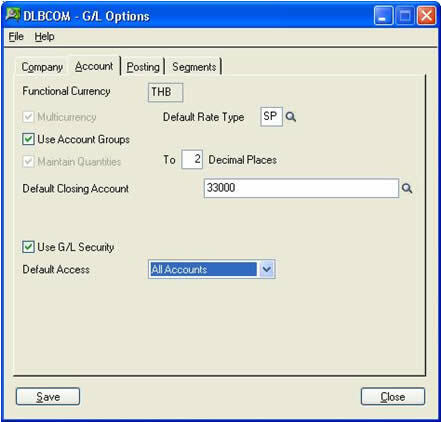 1.Turn on G/L Security by selecting Use G/L Security on the Account tab of the G/L Options form. You must also choose the default user access (whether, by default, users have access to all accounts or to no accounts). 2. Open the Account Permissions form in the G/L Accounts folder. If you have already added the User IDs to G/L Security, you can browse through the list of User IDs using the Previous and Next buttons or you can click the Finder button and choose a User ID. If you have not added the User ID for which you want to set permissions, click the Zoom button as shown below to display all Sage Accpac User IDs, and then select the User ID from the Finder that appears. a)	Click in the first row of the Allow column, then use the Spacebar or double-click to switch between No and Yes. If you are adding a line, press the insert key. b)	Tab to or click in the Segment column, and then click the dropdown list that appears. 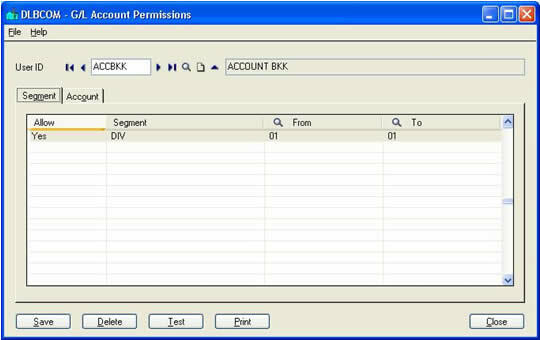 For example, you could select the Division account segment to restrict account access based on the company's divisions. c)	Tab to the From column and click the Finder button that appears (or click the Finder in the column heading). Select the first segment code in the range that you want to allow or restrict. d)	Tab to the To column and select the last code in the segment range. e)	Press the insert key to specify a second segment range on a new line. f)	Click the Save button if you are finished setting account permissions for this user. Note: You cannot choose a range of account numbers on this tab. You must use the Account tab to specify an account range. 5. 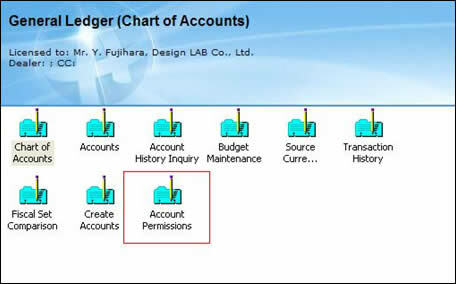 Choose the Account tab to allow or restrict access to ranges of account numbers. a)	Click in the first row of the Allow column, then use the Spacebar or double-click to switch between No and Yes. b)	Tab to the From column and click the Finder in the column heading. Select the first account code in the range that you want to allow or restrict. c)	Tab to the To column and select the last account in the range. d)	Click the insert key to specify a range of account numbers on a new line. Click the Test button to test the account segments you have specified. The Finder-Accounts form lists the accounts this user has access permissions to see and work with. If you need to set up identical permissions To set up identical permissions for several, you can create permissions for one user and copy them to other user IDs by using the File menu's Import and Export commands to import and export user permissions.